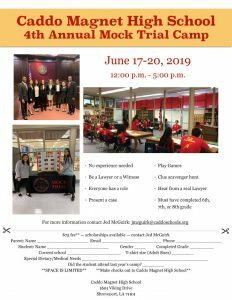 CMHS Mock Trial are hosting their 4th annual middle school summer camp June 17-20, 2019. Students who have finished 6th, 7th, and 8th grade are eligible to learn the ins and outs of Mock Trial from the reigning regional champions. Space is limited! Mail your registration form to Jed McGuirk at CMHS to secure a spot.